Time for another super glamorous mug shot! As I type this I am slathered in this thick, yellow, herb-flecked mask from LUSH, which I've been using liberally about twice a week since I was sent it in mid December. I hate waste and as it's a fresh face mask I'm determined to use it all up within its 3 week lifespan, which is just coming to an end. These products are made from fresh active ingredients and contain no synthetic preservatives so you have to keep them in the fridge and use them before they go off. Years ago I forgot all about one of these to discover it months later at the back of my fridge. It had contained fresh bananas: let's just say it wasn't pretty. But onto Brazened Honey! This is pretty much the business. Everything you need to combat whatever winter chucks at your skin, it's described as "a powerhouse of effective ingredients for all tired skins, exfoliating, detoxifying, stimulating and nourishing." It's packed with herbs, spices, fruit juices, ground almond and honey as well as purifying clay. Slather it on and your face tingles and feels slightly warm - so it might not be the best choice if you have sensitive skin. But my combination skin loves the stuff. I rub it into my skin a little as I'm washing it off and am left with smoother, clearer, brighter looking skin. Brilliant. Fresh face masks from LUSH cost from €6.90 for 75g each. There's enough for about 8 generous applications to a tub. Once I use up my Christmas goodies and bring back the tubs, I'm looking forward to trying out more from the range -- if you bring back five clean containers, you get a free mask! Which one should I check out next? Aw, I think you look cute. I love this stuff, my skin gets really dehydrated and I find this is a bit of a saver. 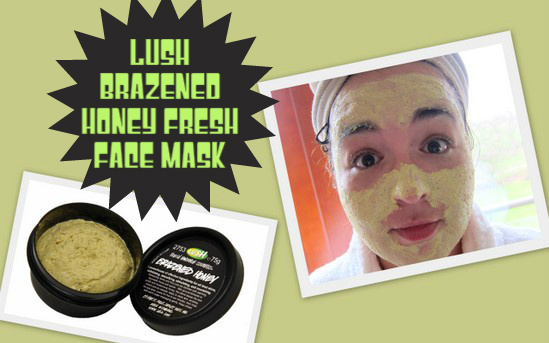 A lot of the lush face masks actually- mask of magnaminty is really good for breakouts, even on your back. Mask of magnaminty - that's a fab name T! I liked the blueberry one, I cant remember the name, smelled like yogurt and the lettuce one which I also can't remember the name of... Sorry, am rubbish! This sounds lovely and effective Emma - I'm now dying to put a face mask on, put my feet up and have a cup of tea - but alas it is only Thursday. Looking great! Next time I'm close to a lush store I'm going to stock up, I wonder are the products much different here in Aus?! I'll be sure to let you know! I'm a big fan of Lush face masks and this sounds great. My current go to one is Catastrophe Cosmetic (I'm pretty sure that's the blueberry one Karen mentioned above). Oatifix was a firm favourite of mine in past too. Ive heard so many rants and reviews on lush products, but ive never purchased any, this looks very interested I might give it a try! Thanks for the actual picture showing what the product looks like! By the way I found your blog through Mondays Beauties Blog Hop and am now a new follower!